We use West System Epoxy Resin, click here to learn more! 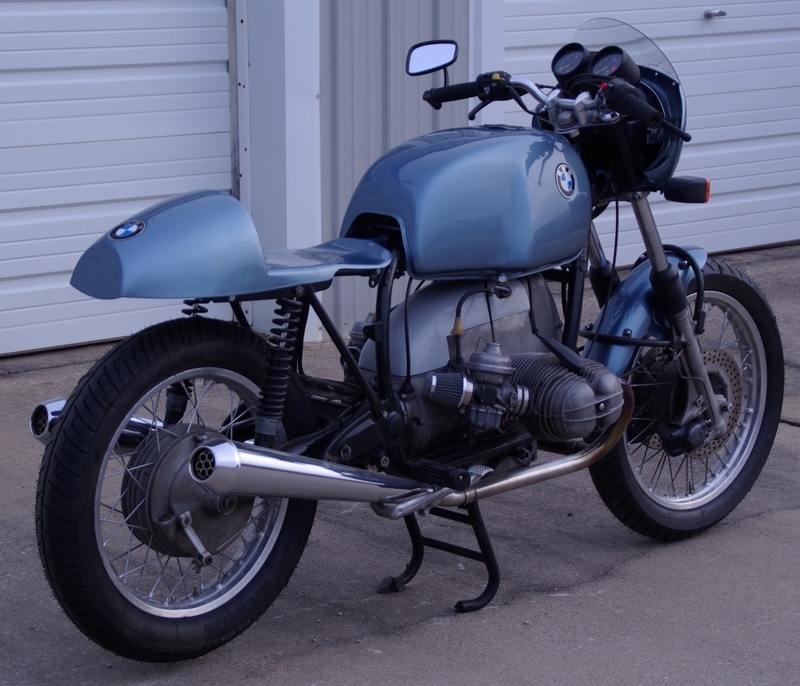 to really clean up your Airhead for that pure Cafe look. There are no vent holes in the starter cover, this is left up to you to add if needed. PLEASE READ THESE COMMENTS ABOUT THE STARTER COVER. Each Starter Cover is trimmed in the mold then hand sanded and test fitted on a BMW engine block. We spend as much time as reasonably possible to make them fit as best as we can. It is time consuming and in many cases, it can be made to fit better. We leave that up to you. We simply can’t afford to spend more time on each part. 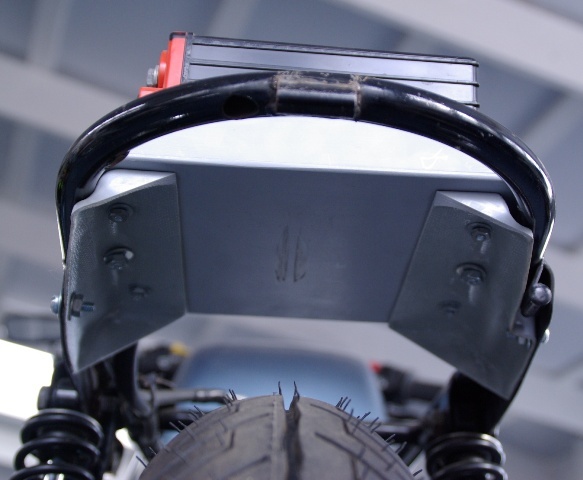 There are 4 corners that, when mounted on the engine, are unsupported, the front 2 bottom corners and the back 2 bottom corners. These are problem areas that we have worked hard to make as good as possible. Frankly, there were many times during the development of this project that we considered dropping it. But the Starter Cover is a great looking addition to the Airheads and we desperately wanted them for the bikes in our collection. Here are several photos showing the details of how the Starter Cover fits on the engine. Please study them closely and determine if it will work for you. I would rather that you not order the part if you are going to be unhappy with it. 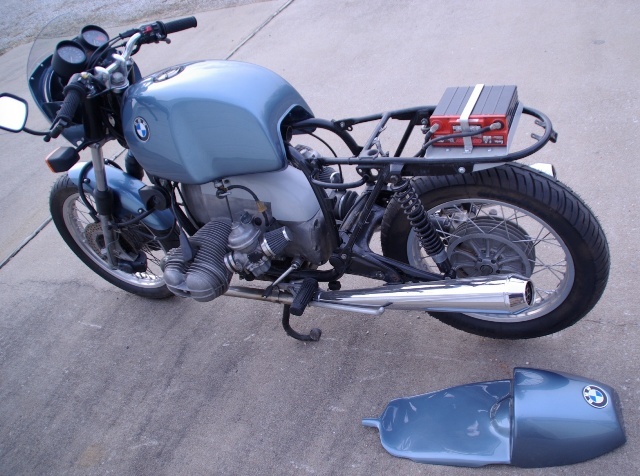 Includes all necessary BMW plugs and gaskets to remove airlines and the airbox on 1981 - 1995 Airheads. 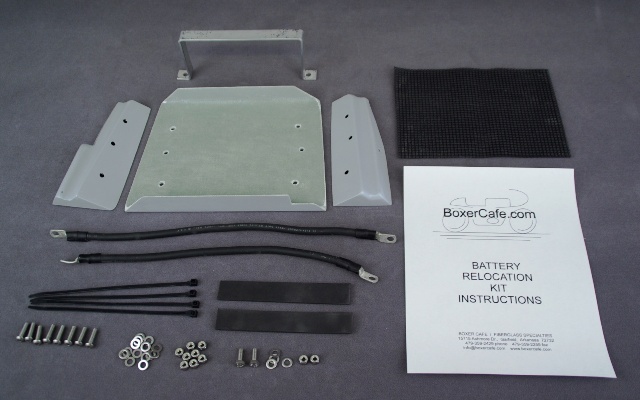 Battery Relocation Kit fits SWB and LWB subframes and cafe tails. The 3-piece fiberglass tray can be made either black (left) or gray (right). This kit is designed to be used with an Odyssey PC 680 battery. Priced separately. Aluminum battery strap. 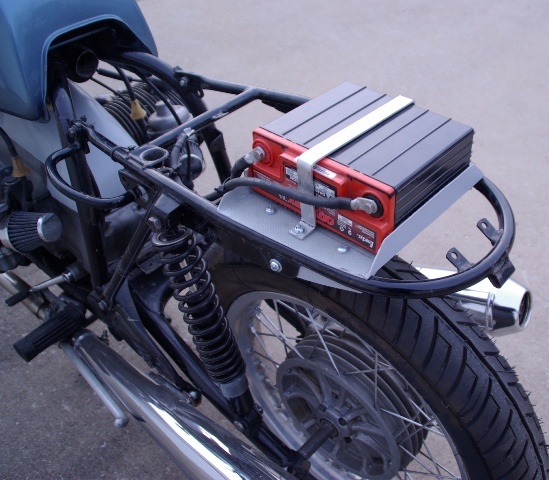 stainless hardware, battery cushions, zip ties and custom high quality battery cables. Your questions about how this is designed to work are probably answered in our Instructions document. Please click here to download and take a look. 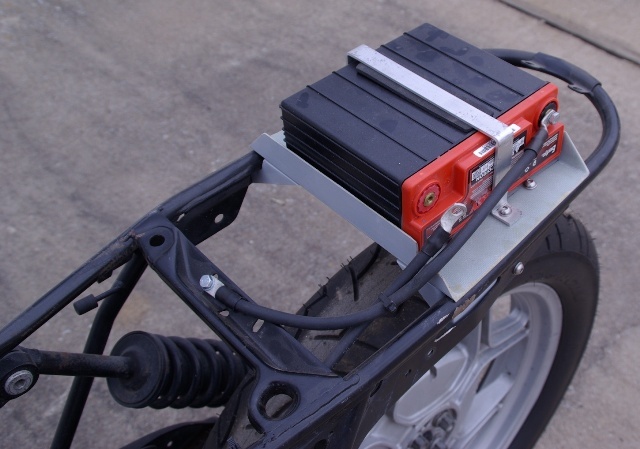 The battery tray sets flat across the top of the sub frame so there is room enough for the battery. Our bike had worn out shocks and a 235 lb rider on a rough road. Here you can see the amount of tire rub we experienced. 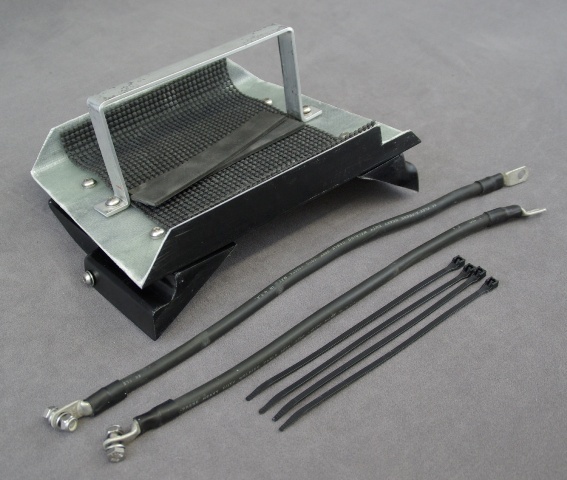 We recommend installing custom heavy duty shocks with extra length to help prevent the tire rubbing the bottom of the tray. Please click here to download our Battery Relocation Instruction Document. Our fiberglass parts are unfinished. This means you will need to sand, prime and paint the part. You will also need to drill any holes necessary to mount the part. 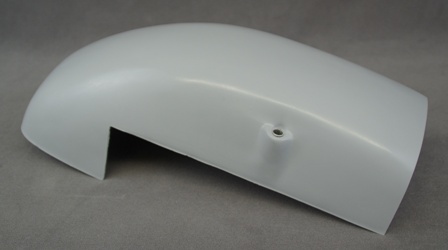 Mounting hardware is not included, only the replacement fiberglass part. If any hardware is included with the part, it will be stated in the description. NOTE: Occasionally there may be surface imperfections that will need to be sanded or filled and leveled. Some parts may have flashing that will need to be sanded, filled and leveled. Air bubbles are an inherent problem with hand laid fiberglass. Occasionally you may expose an air bubble while sanding the surface. Any air bubbles will need to be filled, sanded and leveled. 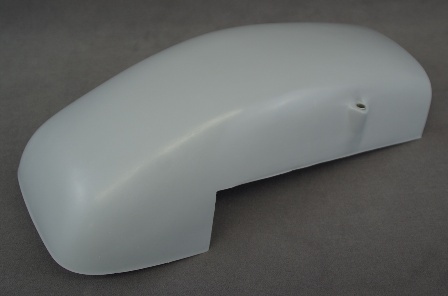 You can read more on our FIBERGLASS PART INSTRUCTIONS page.